Taseer, 27, was on his way to work at around 10.30am (0630 BST) when he was taken at a busy junction in Gulberg, the most upmarket part of the city. The kidnappers have not been identified but there are fears that jihadists are involved. Pakistan is not a country of terrorists, but rather a country afflicted by terrorists. Although the perpetrators of today’s kidnapping have not yet been confirmed, we know that whoever committed this act are not Pakistanis. They are not Muslims. They are not human beings. They reek of the rot and decay that plague this society, that people like the Taseers have had the courage to challenge and stand against. I’ll update this space as news comes in and send thoughts and prayers to his family for Shahbaz’s safe return. 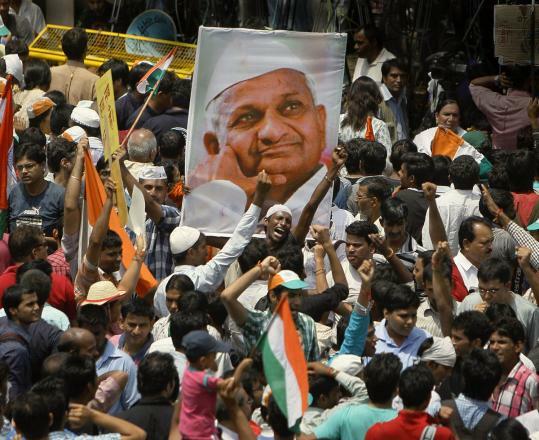 In India, Anna Hazare has sparked a movement. The 74 year old who the NY Times noted evokes a Gandhian simplicity, “has emerged as the unlikely face of an impassioned people’s movement in India, a public outpouring that has coalesced around fighting corruption but has also tapped into deeper anxieties in a society buffeted by change.” This past Tuesday, Hazare was arrested while he was on his way to a New Delhi park to begin a hunger strike to protest corruption in the country. The arrest drove hundreds of people to the streets, and though government officials moved to release him hours later, Hazare refused to leave until they agreed to release him unconditionally. Hazare’s hunger strike hasn’t just inspired Indians, though. According to news agencies on Thursday, a Pakistani activist has decided to launch his own hunger strike against corruption in Pakistan. However, since the whole country is in fact hungry (*cough* fasting *cough*), Jahangir Akhtar has stated he will wait until the end of Ramazan to launch this protest. Good thinking, Akhtar. The political activist also emphasized that he wasn’t “inspired” by his Indian counterpart. Oh no. He decided to launch the strike first. Hazare just stole the spotlight. Akhtar told media outlets, “I announced my hunger strike before Anna Hazare, but due to Ramazan I postponed it, because our custom in Pakistan is that I cannot take water during Ramazan.” Ok. Many Pakistanis, like their Indian neighbors, are tired of financial malfeasance from their politicians, armed forces and others. Yet civil society is much weaker over the border, and street protests other than those organized by Islamist parties are relatively rare. Mr. Akhtar’s quixotic campaign for now appears unlikely to garner much support. While I disagree that civil society is necessarily weaker, (you have to spend a day in the same room with some of Pakistan’s most vibrant female activists to get my drift), I do think that issues in Pakistan are much deeper and bigger than corruption, at least for right now. Fatigue has seeped into the very fabric of our society. It’s not a question of Pakistanis protesting, but what they should be protesting first. The issue of perception is key here. Last year, Transparency International released their 2010 Corruption Perceptions Index, which measures the degree to which public sector corruption is perceived to exist in 178 countries around the world. Corruption, according to TI, is defined “as the abuse of entrusted power for private gain,” encompassing practices in both the public and private sectors. The CPI scores countries on a scale from 10 (very clean) to 0 (highly corrupt). On the 2010 index, India ranked 87 out of 178 surveyed countries (the higher the number, the more corrupt you are). Pakistan ranked 143rd. Although the CPI doesn’t measure citizen perceptions of corruption, TI’s Robin Hodess noted there is a close correlation between public attitudes (measured by their Global Corruption Barometer) and the index. For the purpose of Pakistan, I went back to the most recent Pew poll released in July [it should be noted that this wasn’t some scientific comparison]. According to the poll, 74% of Pakistanis polled say corrupt political leaders “are a very big problem,” compared to 71% last year, 64% in 2007, and 58% in 2002. This past year, I participated in a working group on Entrepreneurship in the “Islamic World” during the U.S.-Islamic World Forum. One attendee, a Tanzanian businessman, discussed how the issue of corruption – specifically petty corruption (low-level, small-scale practices), was so intrinsically part of these societies that organizations incorporate them into the realities of doing business – terming them “transaction costs.” This is obviously unfortunate, but that reality will not change until the attitudes associated with corruption are addressed. And there have been concerted attempts – the Punjab Model for Proactive Governance is a recent initiative by the Punjab Chief Minister’s Secretariat “to fight petty corruption, improve service delivery, and facilitate citizen engagement by proactively seeking through SMS and calls feedback of citizens who receive day-to-day government services.” Introducing accountability is key; but corruption is not just a low-level phenomenon. But as the aforementioned Twitter people noted, is corruption itself a hindrance to the progress of this society, or do we have much bigger issues to tackle first? And, as a result, will that be why we will not see a Hazare movement in Pakistan?